"Instant messaging application that keeps surprising us with new features"
Hotmail was one of the first email providers, and still has millions of users around the world. This was due to, not only the email service itself, but also to its instant messaging application, known as MSN Messenger. 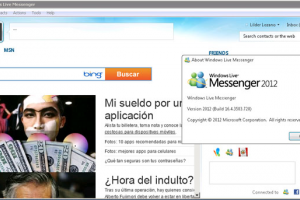 This instant messaging application evolved in what we know as Windows Live Messenger, one of the best and most popular instant messaging applications. Windows Live Messenger features a friendly interface that allows you to easily organize your contacts in categories, for example: Friends, Relatives, Colleagues, and others. You can also add a profile picture (avatar), a nickname and adjust your status, just like most instant messengers nowadays. And something really cool, is that there are a lot of games you can play with your friends while chatting. Windows Live Messenger also integrates with different social networks, as you can, for example, check your friends' Facebook updates right on the program's main panel. It is also easy to share files, pictures, music and videos, and you can even share a complete folder. This nice communication program allows you to send messages to your friends even when they are not online, and they will received them once they log in. Worth mentioning: it also supports video conferencing.